Full sets of evaluations from six of my most recent courses are available as sub-links on my entry-level and advanced course pages. For the sake of clarity and space, however, I have quantified these evaluations, breaking them into two sets in the tables below. 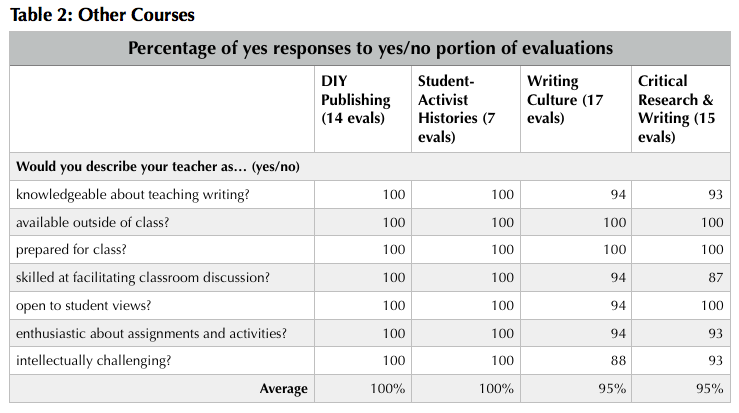 Table 1 summarizes data from my professional writing courses, since the yes/no questions asked on that evaluation differed slightly from the other forms in my department. Table 2, therefore, incorporates evaluations from a diverse set of courses, from research writing to historiography to publishing. All told, 96% of yes/no responses from these courses — a ratio derived from 83 evaluations — were positive.